When Ken Griffey Jr. made it to the majors in 1989, few could have predicted the jolt he would give baseball and the card collecting world. What ensued was one of the greatest rookie chases in collecting history. The demand pushed Ken Griffey Jr. card values to unlikely heights and firmly planted him in rare collecting company. Now in the Hall of Fame, Griffey's cards are again on the move and his rookies are a key option for collectors. Shop for Professionally Graded Ken Griffey Jr. Rookie Cards on eBay. The iconic 1989 Upper Deck Ken Griffey Jr. card is the most graded card in history and the strong values have largely remained solid despite huge production runs that inevitably doomed most of the cards of the time. Unfortunately for collectors who were caught up in the rush, many ultimately overpaid in the excitement. Injuries caught up to the superstar and Ken Griffey Jr. card values leveled off. Now, almost all his rookies, except for ones with high professional grades, can be found for a reasonable amount. Few players have ever reached the level of collecting that Griffey spurred on by his amazing athletic ability and charisma. Although he never quite lived up to the lofty expectations that were created by his early successes, he still had an impressive career and had a hand in creating the hobby collectors know today. For his entire playing career, Griffey was a spokesperson for Upper Deck, appearing prominently in almost all their baseball card releases. However, Griffey received his first Topps autographs in 2012 and has also signed for Panini. 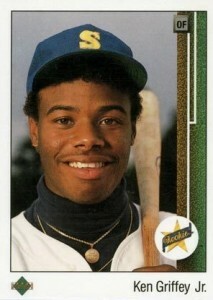 The following guide documents all the official Ken Griffey Jr. rookie cards. 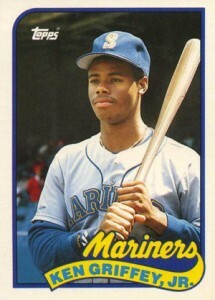 Although they are some of his most common and popular, they are not the earliest cards for Griffey. 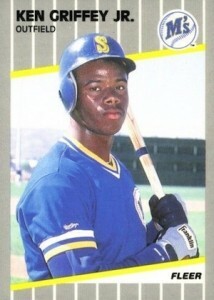 There are also multiple Ken Griffey Jr. minor league cards that pre-date his rookies. The slightly over-sized 1989 Bowman card features a stoic looking Griffey on one knee with hills visible in the background. Griffey's facsimile signature is prominently displayed on the bottom of the card. Another card in the set (#259) pairs father and son with a television design. Both options feature a white border. A rarer Tiffany version of the card also exists. Sold in limited edition box sets, the Tiffany cards feature a glossy finish and lighter card stock and command much higher values. 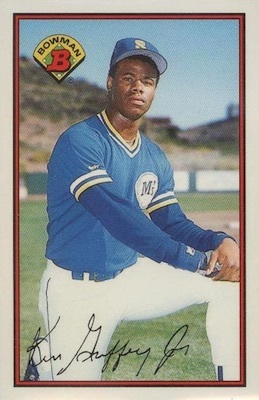 While it does not have the most attractive design, the 1989 Donruss Rated Rookie card for Ken Griffey Jr. in 1989 Donruss is an easy way to snag a cheap first-year card. A huge print run and odd color scheme do the card no favors. Heavy on gray, the added striping in the 1989 Fleer rookie evokes the image of a poorly constructed prison. 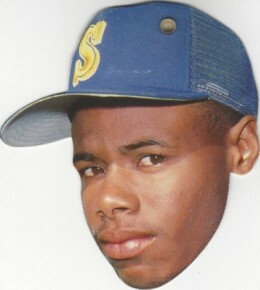 Looking very young in the image, Griffey is also quite sweaty, making for an overall look that has not aged well. 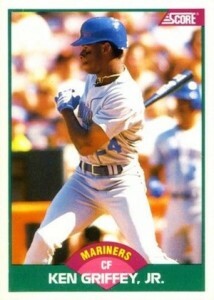 The 1989 Score Traded Ken Griffey Jr. card features a post-swing shot of the Mariner great. Although the overall design has a clean look, the color combination does tend to a clash a bit, especially with the uniform color. Showcasing a similar pose as two other rookie cards (Fleer and Donruss), the classic design and strong image in 1989 Topps Traded set it apart. After the classic 1989 Upper Deck, the Topps Traded card is his most attractive rookie. Collectors have been particularly interested in the limited-run Tiffany version. 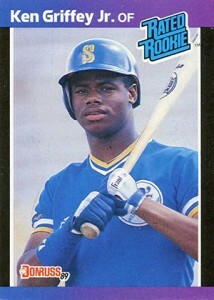 This is the Ken Griffey Jr. rookie card that is head and shoulders above the rest. As the one that started the craze, the 1989 UD rookie will bring back a lot of memories to many current and former collectors. Easily one of the most iconic cards in modern times, this card is a true classic that belongs in every baseball card collection. Not technically a rookie, the elusive 1989 Topps Heads Up Test issue was allegedly marketed to just a handful of stores in Pennsylvania with just 24 boxes produced. The unique card is die-cut to the shape of the player's head and also features the ability to stick to surfaces for display with either a suction cup or tape. Griffey was one of 24 players included on the checklist and remains a tough and pricey card to track down. In contrast, the regular set was officially released in 1990 and values are very inexpensive. 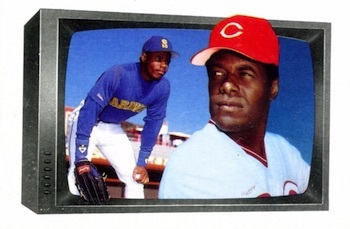 Although he was also included in the 1990 release, the two versions for Griffey can be distinguished by the year listed on the card back. 1989 Fleer Baseball Cards-ken Griffey jr. And More! 1989 Bowman Tiffany Rookie #220 Ken Griffey Jr. I was wondering if you could help….. I have been wracking my brain to think of the 1994 Upper Deck baseball card set that upper Deck decided NOT to produce because of the baseball strike. Would you happen to know ? Hello! I have a question regarding the value of an autographed baseball. I grew up in Seattle, WA and went to Mariners games as a kid quite often. I have a RAWLINGS AL baseball signed by Ken Griffey Jr. at the Kingdome in 1995. I have seen many different values online, and I’m sure it depends on the condition, which in my case is what I would consider quite good. If you could give me a ballpark #(pun intended) for what this may be worth I’d greatly appreciate it.